Cruella de Vil in the 1961 animated feature 101 DALMATIANS. For my second installment in Countdown to Hitchcock Halloween, in which I am profiling several scary characters from classic film, our focus is on that sociopath socialite who lives for puppy furs (boo! Hiss! 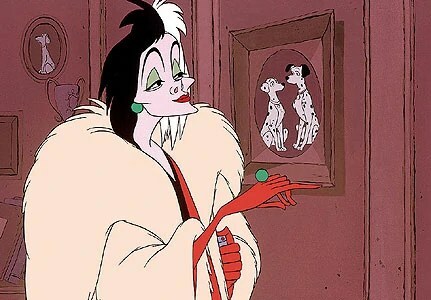 ), the insufferable Cruella de Vil, who made her appearance in 1961’s 101 Dalmatians and has a bit of a secondary connection to classic film as well. Cruella de Vil is a rich socialite with a sizable collection of fur coats, and when she hears that her friend Anita’s dog is having puppies, her interest is piqued in a coat made of dalmatian puppy fur. She drops by to see the puppies but is told that the puppies will not be born for another 3 weeks, so on a stormy night 3 weeks later, she returns for the puppies. She is enraged when she finds out that the puppies are not for sale, so she sends a pair of thieves to steal them. The movie chronicles the puppies’ life with Cruella and the ordeal of their owners to try to get them back. It is perhaps one of the most harrowing Disney movies ever released, due in large part to Cruella’s evil nature. Cruella was voiced by little-known character actress Betty Lou Gerson, whose Tennessee upbringing and formal voice training created the voice we all know so well as that of Cruella de Vil. Gerson was born in Chattanooga, TN, and began to work in Chicago-area radio in the 1930s after relocating there after high school. 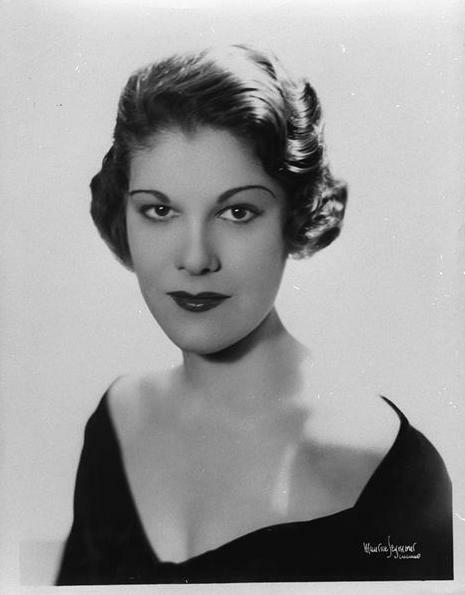 Gerson moved to Hollywood in 1949, soon hearing her uncredited voice prominently featured as the narrator in Cinderella (1950). She continued to act in small roles on television throughout the 1960s on such series as Bachelor Father, Perry Mason, and Hazel, before retiring from the business after the death of her husband. She passed away in 1999. In the novel The Hundred and One Dalmatians, written in 1956 by Dodie Smith, Cruella is a tempestuous character who has little regard for anything but her own vanity. She is a glamorous and spoiled London heiress who lives for furs and jewels. When Walt Disney got a hold on the property and came calling for the role of Cruella, he knew exactly where to look for a basis. Dodie Smith had even written Cruella with a certain Hollywood star in mind. Like Betty Gerson, Tallulah Bankhead was born and bred in the South. Hailing from Huntsville, AL, Bankhead was known for her glamorous, indulgent lifestyle and for her bon vivant personality that dominated every room she entered. Dodie Smith stated that she intended Cruella de Vil to be an evil parody of Tallulah Bankhead, and that intention is well reflected in the movie. From Gerson’s voice to the animations of Cruella’s movements, it could easily be Tallulah playing that part. It must be noted, though, that there was one way in which Tallulah Bankhead was unlike the character she inspired–Tallulah was a passionate animal lover! Tallulah Bankhead and Winston Churchill, the lion cub she adopted. This entry was posted in Lara Gabrielle Fowler and tagged 101 dalmatians, betty lou gerson, cruella de vil, disney, halloween, tallulah bankhead. Bookmark the permalink. SO enjoying your countdown. It makes me not want Halloween to come so I can keep enjoying your fun and interesting posts! My autistic/developmentally delayed son doesn’t have a full grasp of independent language, but all of his life he quotes lines from movies where he thinks they are appropriate. Once he picked up a ringing telephone and shouted into the receiver: “I don’t care how you kill the little beasts, but do it and do it now!” I like to think it was a telemarketer on the other end of the line. I forgot to thank you for the interesting background on the talented Ms. Gerson. Thanks. My pleasure, it’s a shame she wasn’t more well-known.